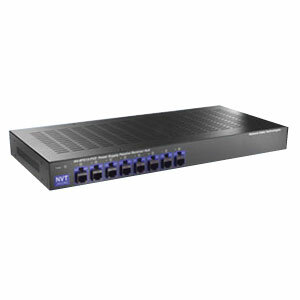 The NVT Phybridge 8-channel NV-8PS13-PVD is a key hybrid component that consolidates all CCTV system cabling using standard EIA/TIA 568B structured building wiring. Designed for installation in the IDF/Telecom Closet or MDF/Equipment Room, the Power Supply Passive Video Receiver Hub has independently selectable 24VAC-OFF-28VAC outputs that can support at-distance camera loads up to 1 Amp per channel. Use with NVT Phybridge’s PVD™ transceivers for cable runs under 750ft (225m). A built-in passive receiver hub allows connection to DVR or an encoder for IP transmission. Per-channel diagnostic LEDs display load /no-load, miswires, or fault conditions at a glance. Automatic-reset fault protection, transient protection, and ground loop free individually floating outputs.